Why re-open the Railway ? On this page we will add links to, or enable you to download copies of, reports and articles about the Keswick to Penrith Railway Reopening project. We think you will agree that there are many good reasons to bring back this Railway ! Demand survey forms were distributed via "Kesmail" - the Keswick Post Office's own local newsletter. The results were also published in "Kesmail". In 1998, the book "Return to Keswick - the Case for a new Railway" was published. This brought together all available information and laid out the case for re-opening. CKP Railways plc was formed at the end of 1998 to bring the Project to life. Copies are still available - see the "Sales Items" page for details. 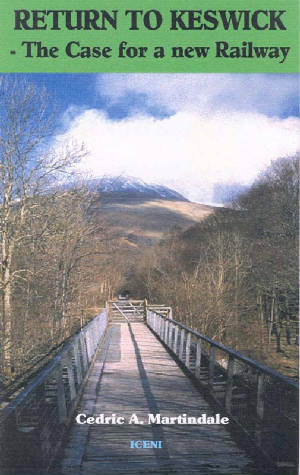 In 1996, Cumbria County Council, the Lake District National Park, Eden District Council and Allerdale jointly funded a "pre-feasibility" study to test Cedric Martindale's ideas abdout reinstating the Railway. The study confimred his cost estimates and agreed that the reconstruction was technically feasible. The consultants ran out of time and money before a full evaluation of likely passenger traffic was undertaken. A partial result was provided, but this was not made clear in the final report. Read Cedric Martindale's comments about the Local Authorities' Report. It was on the basis of this report that Cumbria County Council decided not to take an active role in the Railway reinstatement. In 2001, Brown and Root joined the team. They provided an updated overview of the project for presentation to external bodies. A report from Cardiff University about "Railways and National Parks" was positive about re-opening the Keswick to Penrith line and others. Material is being gathered and converted for easy reading or downloading.